One of two Standard Missile-6 Dual 1 missiles launches from the destroyer USS John Paul Jones during a missile defense test against a medium-range ballistic missile target on Dec. 14, 2016, conducted off the coast of Hawaii. "This test demonstrated the capabilities MDA and the Navy are delivering to our fleet commanders," MDA Director Vice Adm. Jim Syring said in a Dec. 14 statement. 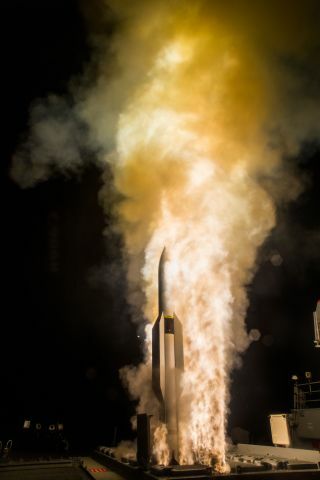 "The SM-6 missile and the Aegis Weapon System continue to prove that they are critical components of our nation's multilayered, robust ballistic missile defense system." "The SM-6 missile uses an explosive warhead to defeat ballistic missile threats, differing from other missile defense interceptors, such as the Standard Missile-3, which use non-explosive hit-to-kill technology," MDA officials wrote in the statement. The SM-6 Dual 1 missile system reached operational status in 2016. More than 315 missiles have been delivered to the U.S. Navy, and more are in production, Raytheon representatives wrote in a Dec. 19 statement describing the recent test. The missiles are designed to defend Navy vessels against threats from fixed- and rotary-wing aircraft, unmanned drones and cruise missiles, as well as ballistic missiles in the terminal phase of their flight, Raytheon representatives wrote. The missile also can be issued as an offensive weapon, they added.